Carrowmore, located only 4 kilometres from Sligo, Ireland, is Europe’s largest megalithic cemetery. Originally 100 tombs were located here although many have been destroyed or damaged. The site is still an impressive piece of ancient Ireland's heritage. What Do The Tombs Mean? These tombs are a statement about just how important ritual was in Neolithic Ireland. They are the equivalent of what a parish church is in our society. Megalithic tombs were the first such monuments to the ancestors. They mark a change in belief systems at the onset of their design. The most important of these monuments here is called Listoghil, (monument number 51). Listoghil is the largest and the most elaborate and advanced tomb built in the area. It was also the last one built. After building Listoghil these people had taken things as far as they could on a flat landscape. Next, they would conquer the hills around and adorn those with passage tombs (Knocknarae, Carrowkeel). Archaeologists now believe that Carrowmore was part of a culture where the size and look of tombs became a status symbol. Ancestors were an important part of their lives. They were venerated and marked with these monuments that symbolised the Earth, or Earth mother. How, and how well you did this, probably reflected your position in society. Notice the stunning setting with mountains all around! The view towards Knocknarae. 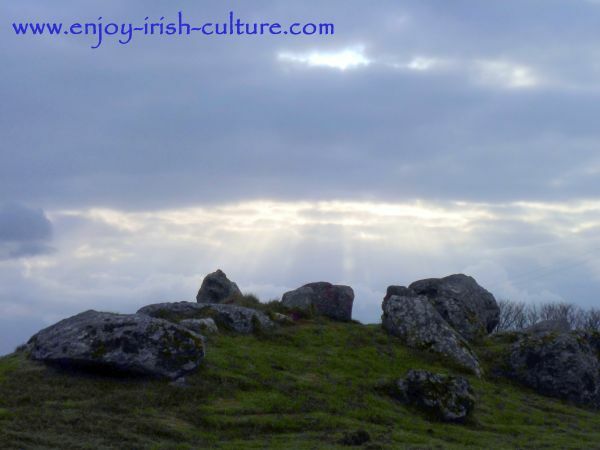 Find out tourist information about Carrowmore. 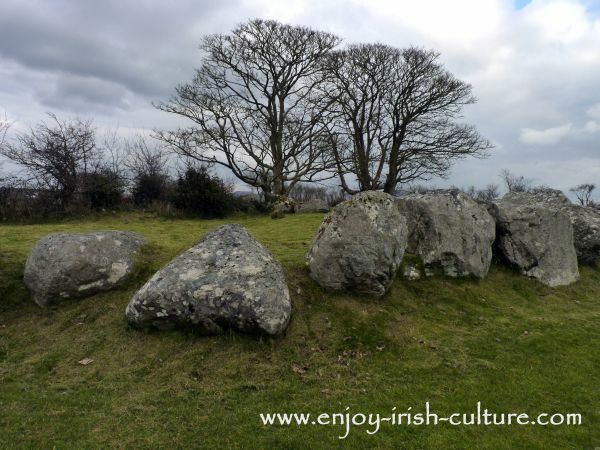 Neolithic Ireland, Part 1 and Part 2, about the society that built these tombs. Read about Irelands' most famous ancient site, Newgrange. Read about Carrowkeel, a sister site nearby. These people were the first farmers in this region. They probably cleared the elm forests around here to make room for their fields. They would have grown staples such as oat, millet and spelt. The stones for the tombs often came from places a good few kilometres away pointing to a wealthy and well organised society. Excavations here at Carrowmore have yielded cremated human remains, jewellery and tools made from antlers and bones. It is possible that the simpler tombs were family tombs, used again and again over the generations. When the bodies were cremated, it was easy to fit in many. In these tombs, they were placed on the floor of the main chamber. Probably only selected people were buried here. What the criteria were, we can only guess. 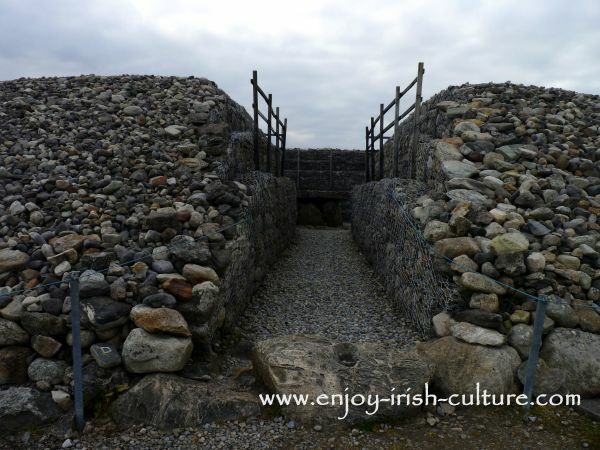 The entrance of the Listoghil passage grave. Where did these Neolithic settlers come from? There is a traditional view among archaeologists that the culture of building megalithic tombs swept across Europe roughly from East to West. There are similar monuments in France and in Portugal and until recently the view was that those predate the Irish megalithic sites. The Neolithic people then would have crossed the ocean to move onto the British Isles. Last sunlight on some megalithic rocks. However, recent carbon dating of tombs number 4, 7, and 27 placed this site among the earliest Megalithic graveyards in Europe suggesting the site was used from around 5000 B.C. Archaeologists are now debating whether the megalithic culture here started as early as it did on the continent rather than migrated here but opinions on this differ. A great piece of ancient Ireland’s heritage. If you are in the area, definitely go and see it. 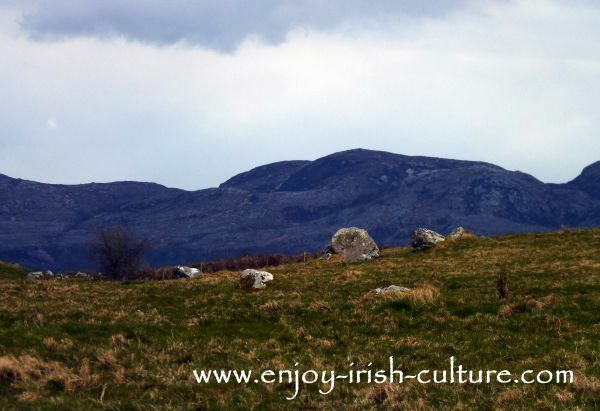 Combine your visit to Carrowmore with a visit to its sister site at Carrowkeel and make a day of it. 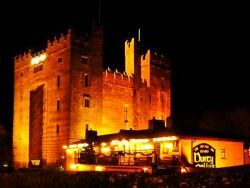 Combine your visit to County Sligo with a raptor show at Eagles Flying, or a trip to Parke's Castle. Don't forget about Sligos beautiful beaches such as Streedagh or Strandhill. Enniscrone beach makes for a day excursion when combined with a visit to the classic facility at Kilcullens' Seaweed Bath. 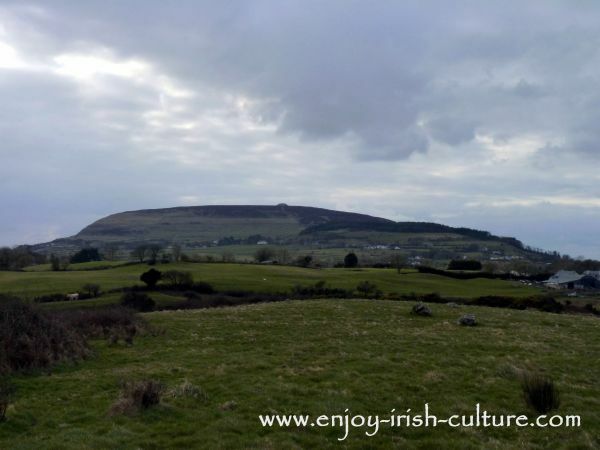 If you enjoyed this article about one of ancient Ireland's premiere sites, and if you like what we do on Enjoy Irish Culture, please pay it back and help us build our audience! Use the social buttons at the top left or at the very bottom or the page, or kindly leave a Facebook comment. Thanks a million. Regards, Colm and Susanna.